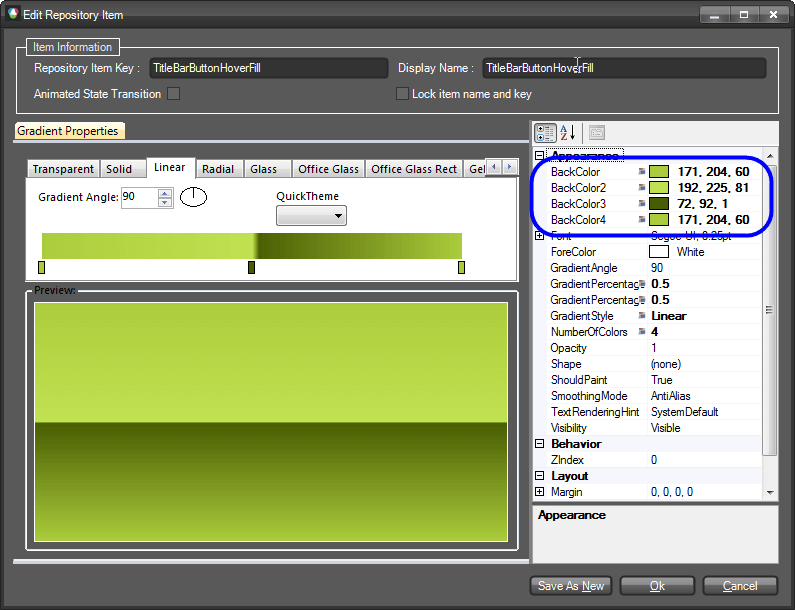 After introducing the new Visual Style Builder a lot of our customers asked how to open an existing theme so that it can be modified achieving a new visual style. Indeed, this is the preferred way to create a new theme if you do not want to begin from scratch by creating an entirely new repository and applying the items throughout the controls set. In this article we are going to demonstrate how to create a new theme for the RadRibbonBar using the Windows 7 theme as a starting point. 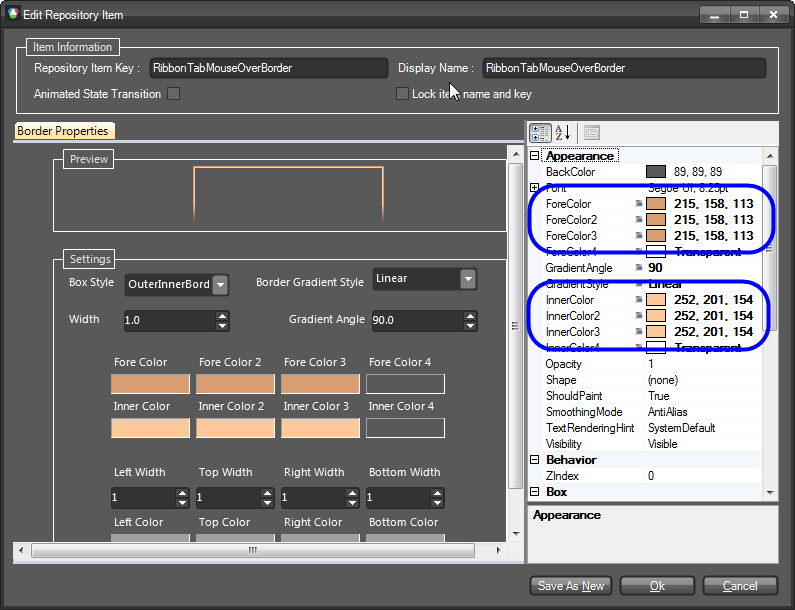 Many of the hints and approaches used here are also applicable when styling other controls. 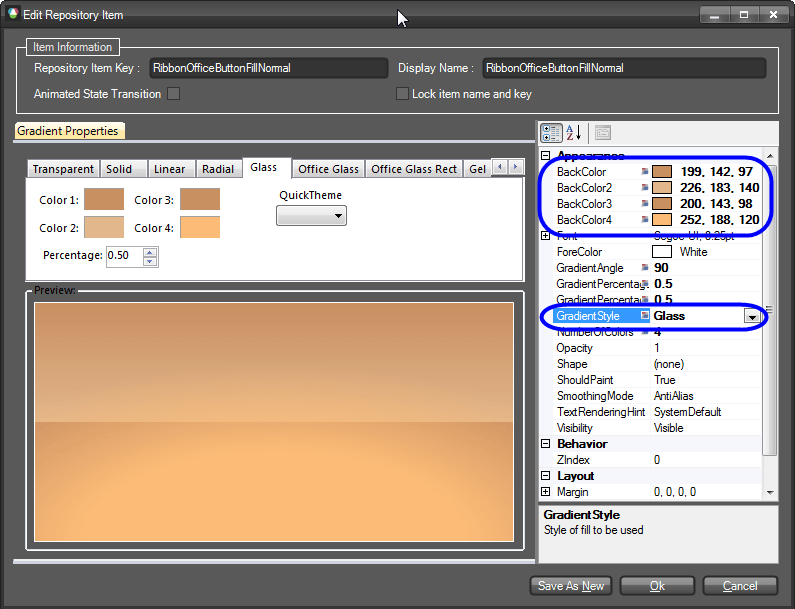 Please note that in this example the repository of the Windows 7 theme will be modified which will surely cause other controls to change their styles as well (remember that repository items are reused among controls). 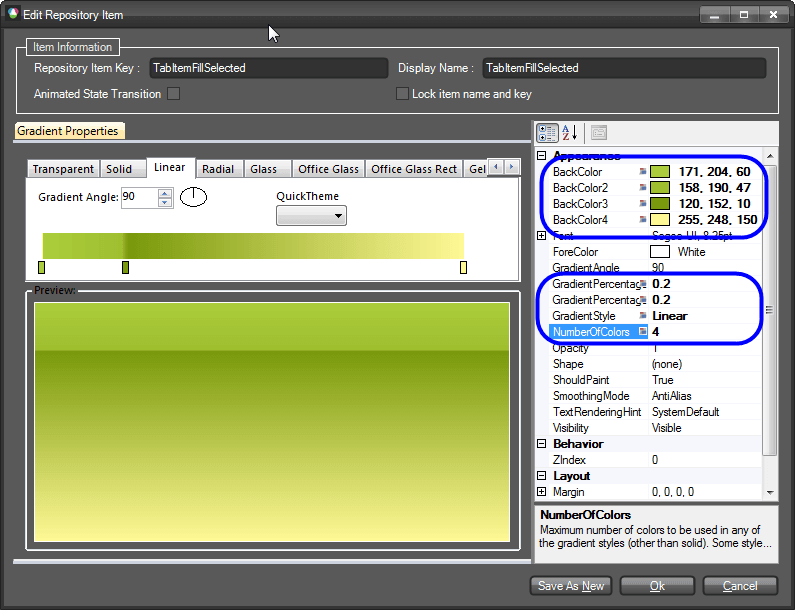 These three categories contain subcategories for the corresponding elements. 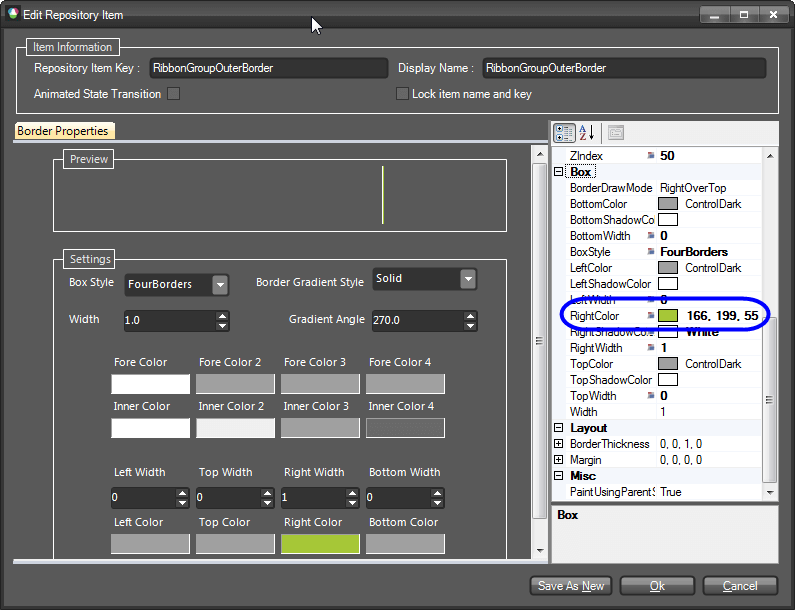 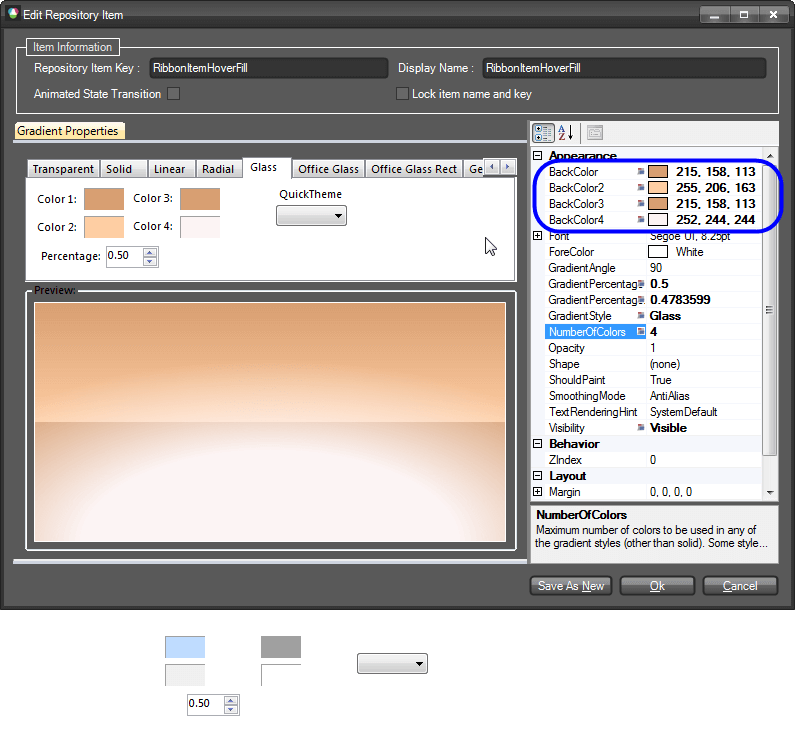 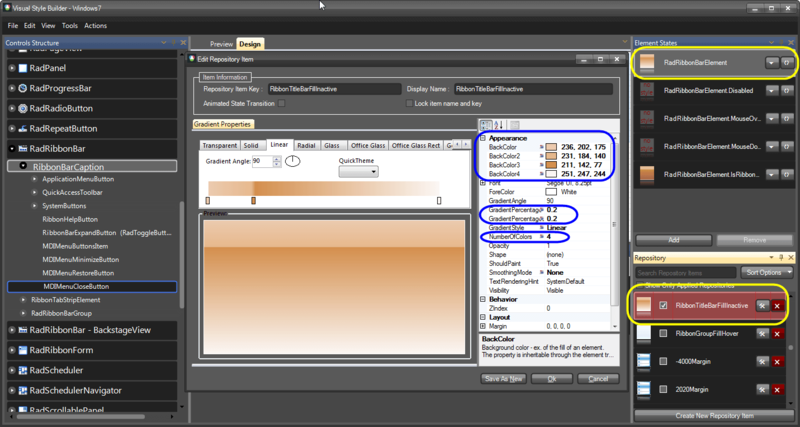 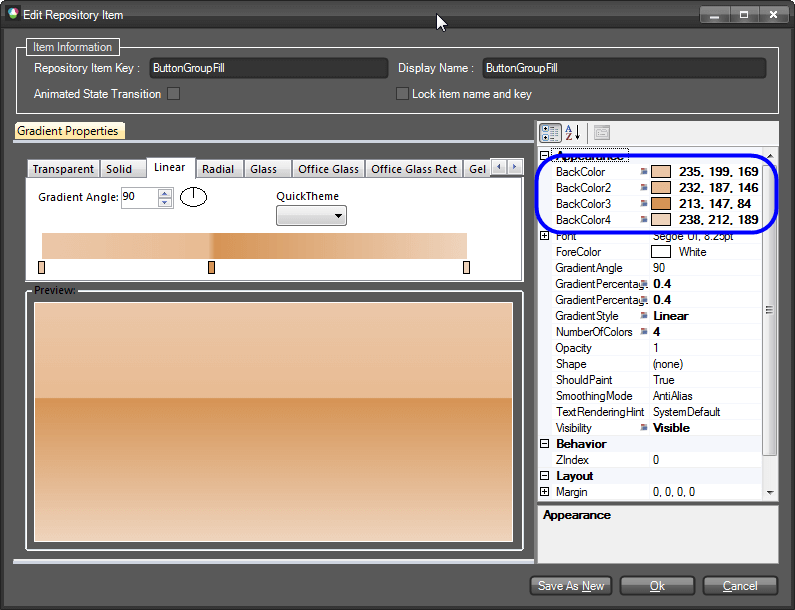 For instance, the RibbonBarCaption category contains ApplicationButton, QuickAccessToolbar and SystemButtons sub-nodes which can be used to style the corresponding elements. 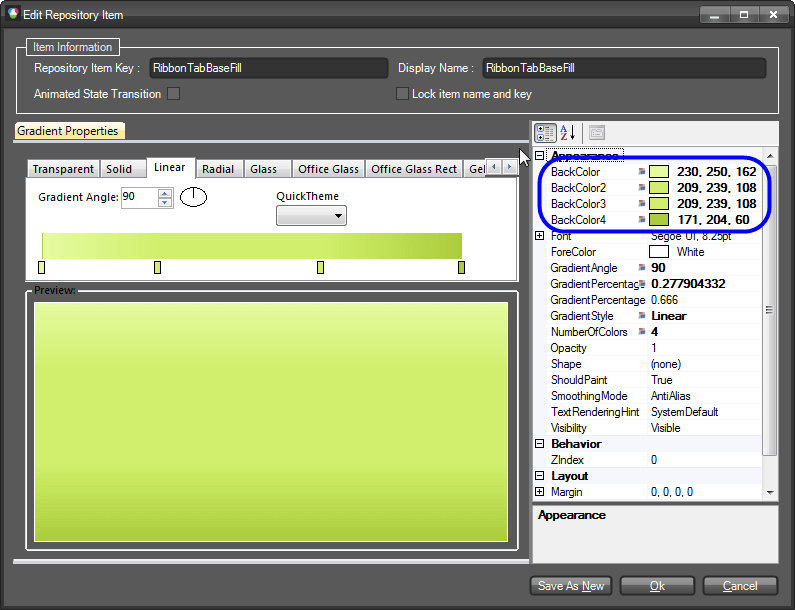 The RadRibbonBarElement.IsRibbonFormActive state is applied to the RadRibbonBar control when it is in a RadRibbonForm and the form is active. 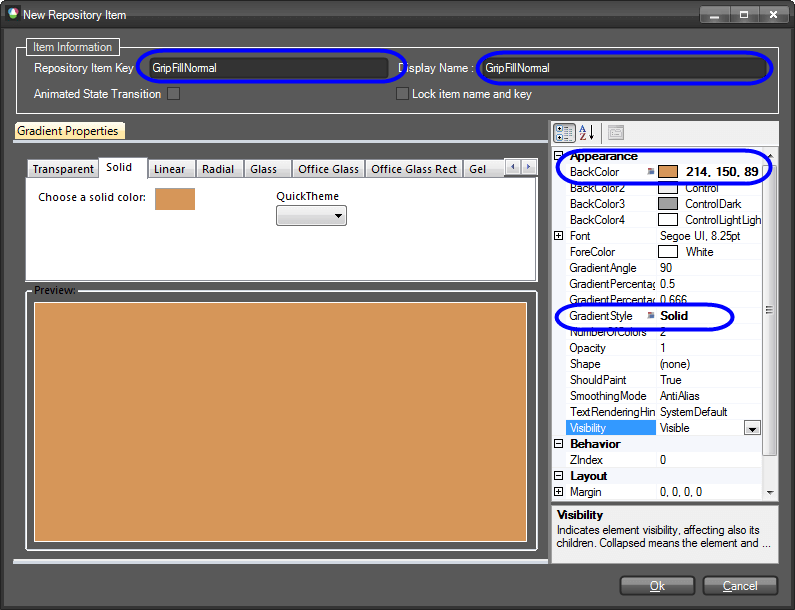 Otherwise the RadRibbonBarElement state is applied since it is the default state. 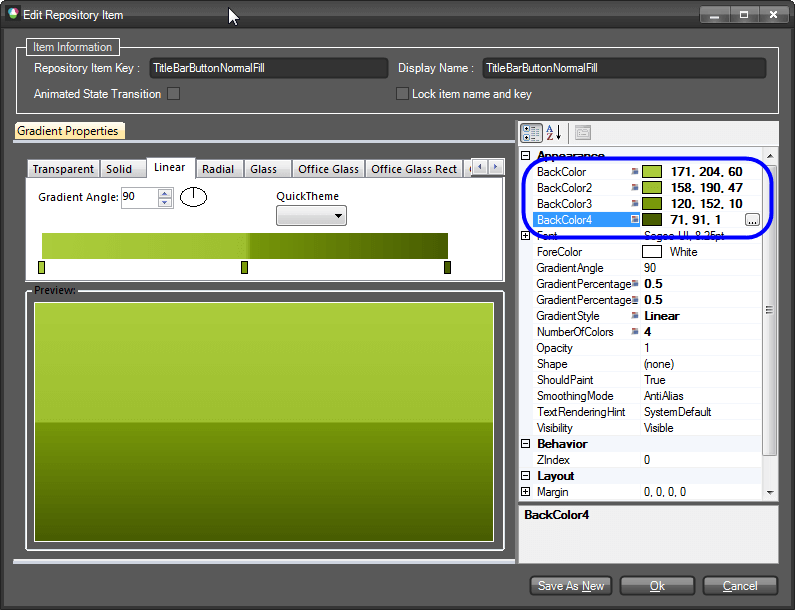 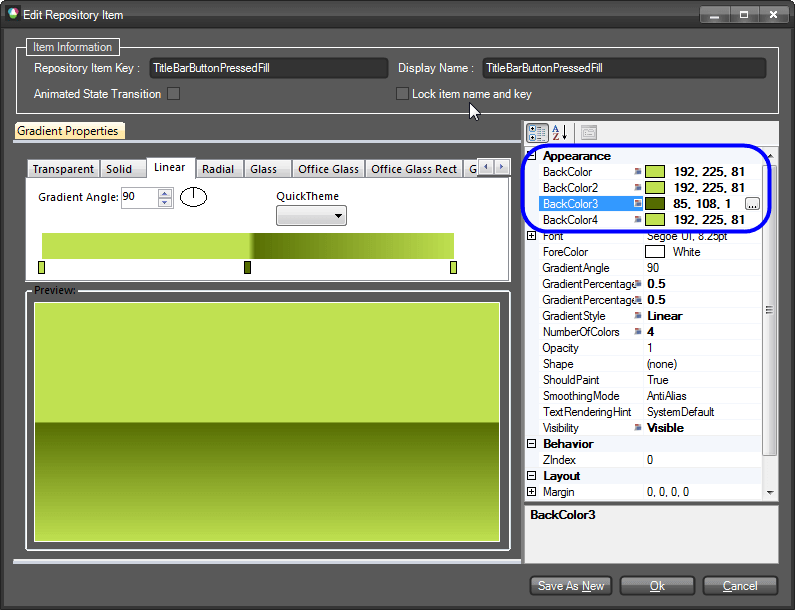 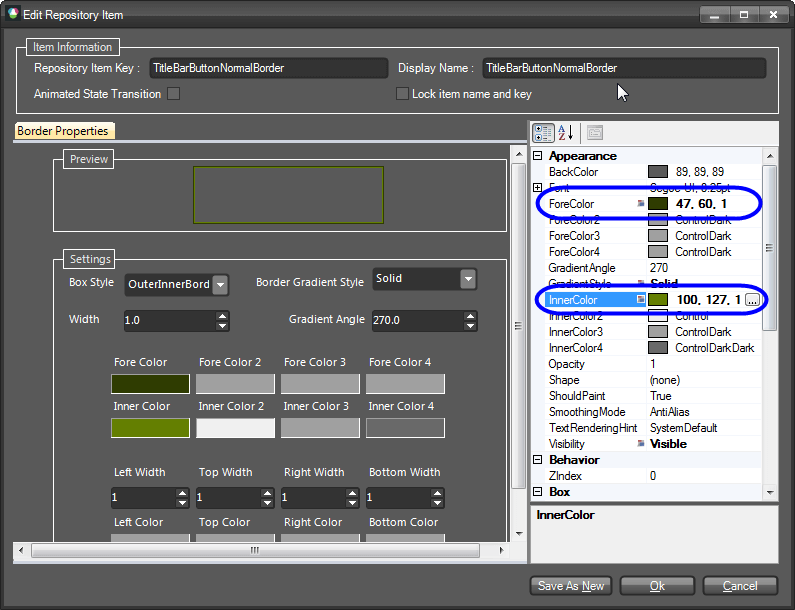 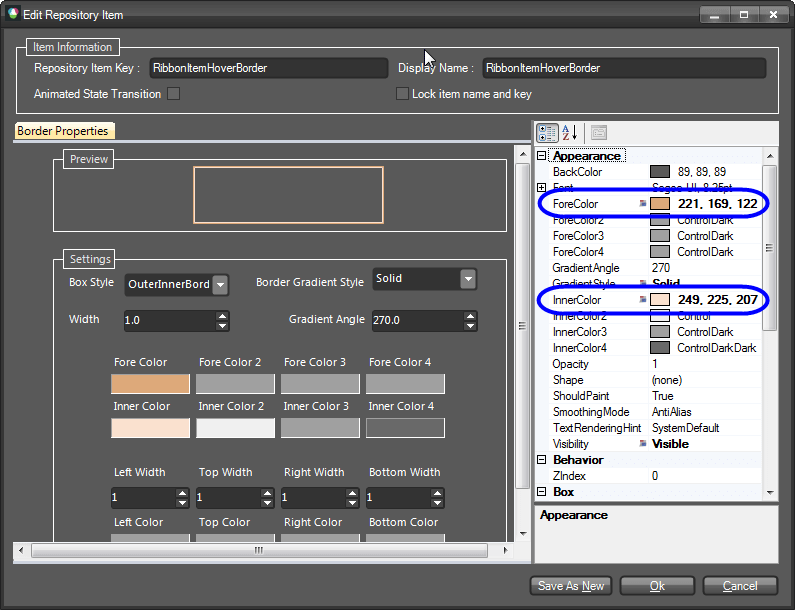 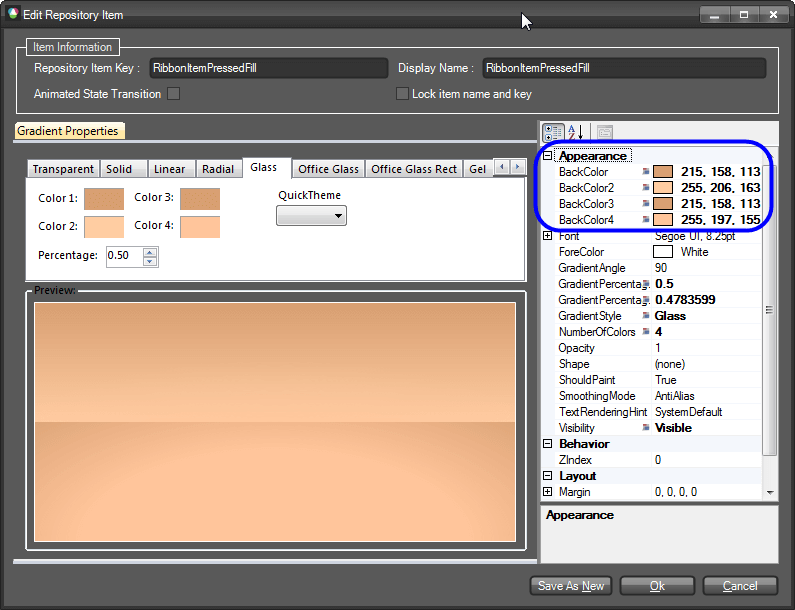 In this way we have defined styles for the Active and Inactive states of the RibbonBar’s caption fill. 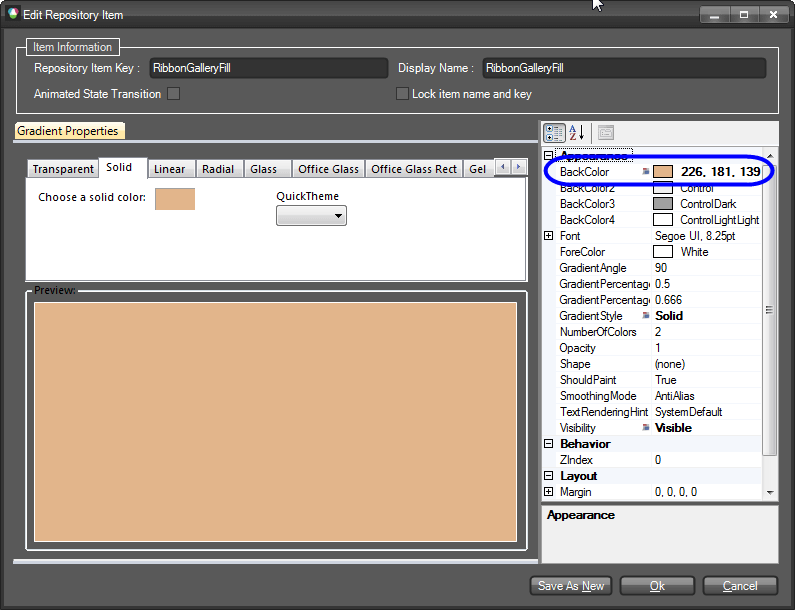 You can do this for the RibbonCaptionBorder element using the same approach. 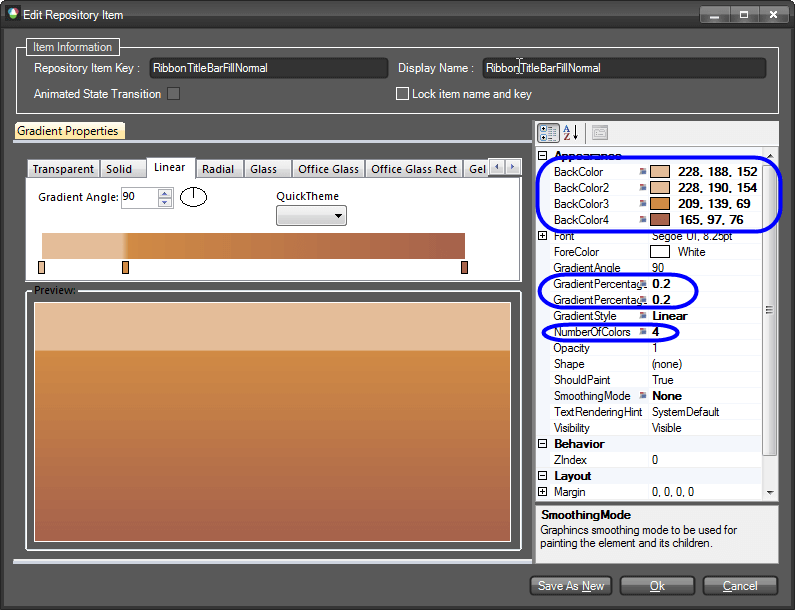 Since the repository items we have just changed are reused throughout the whole RadRibbonBar, the styles of other elements have also been changed. 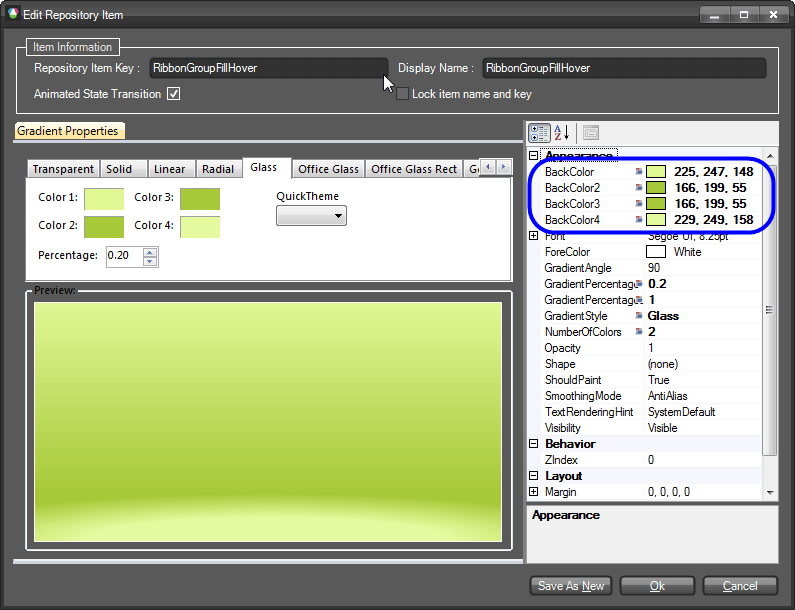 For instance, if you hover a button in a RadRibbonBar group, you will notice that it looks the same way as the button in the Quick Access Toolbar. 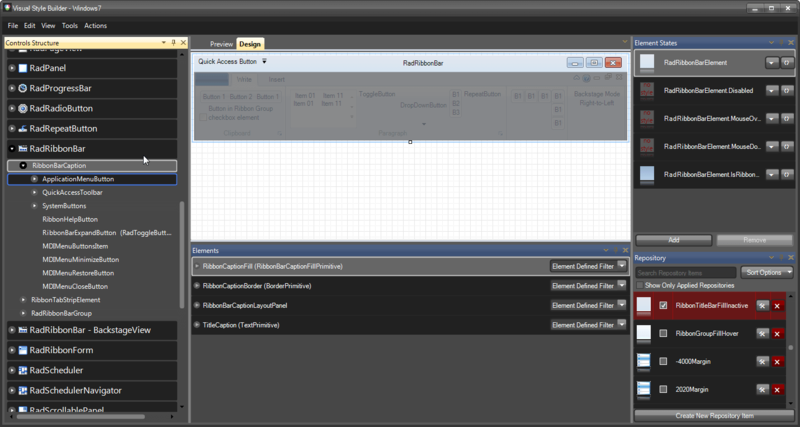 In this way, by reusing repository items, we need to introduce our modifications at a single place and in order to get them applied throughout the whole control. 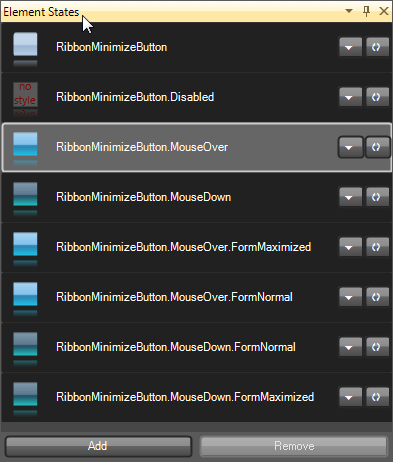 We will leave the RibbonCloseButton as it is. 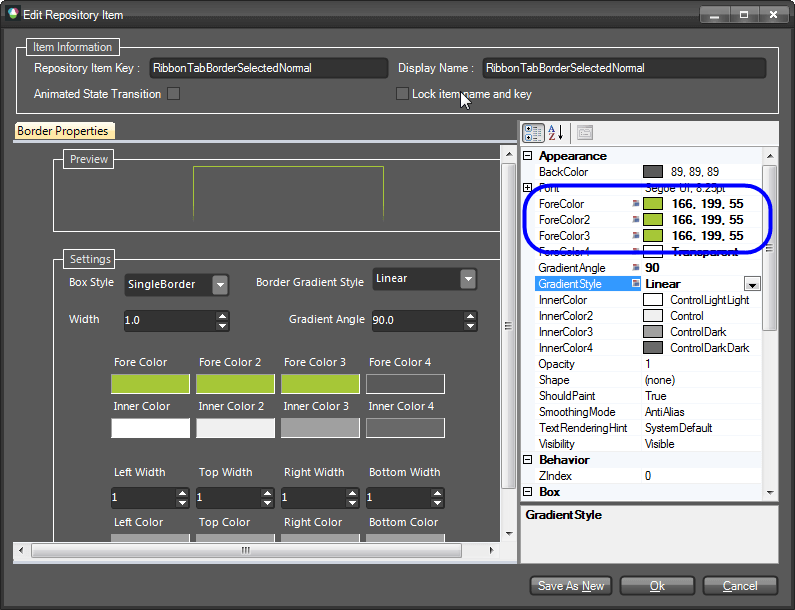 You can now try to change the styles of the RadCheckBoxElement in the RadRibbonBarGroup accordingly. 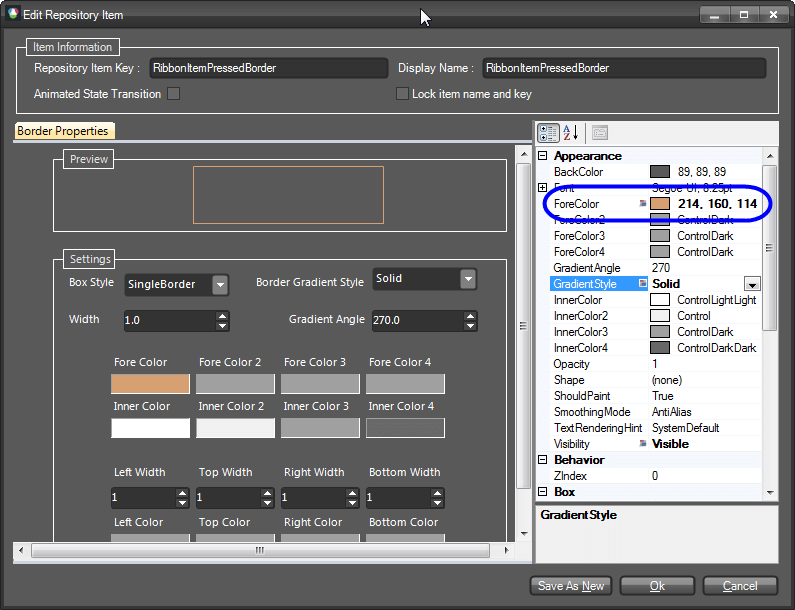 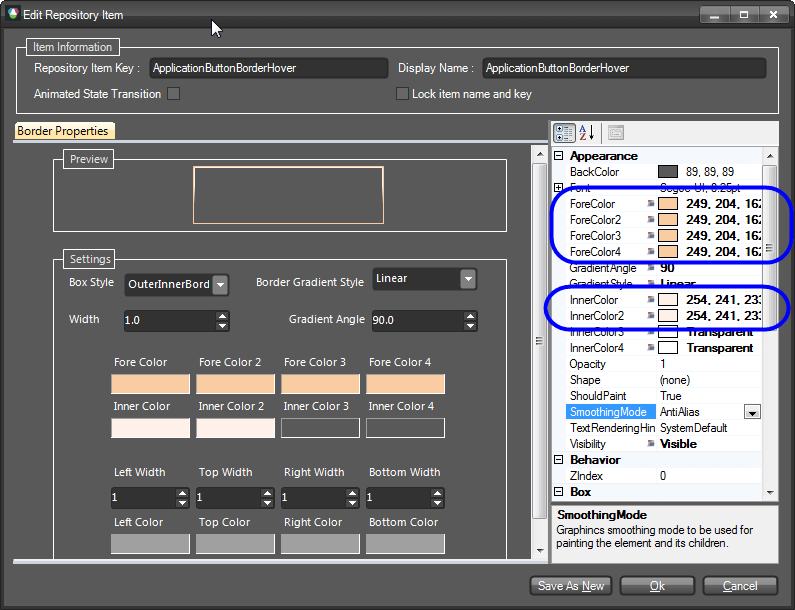 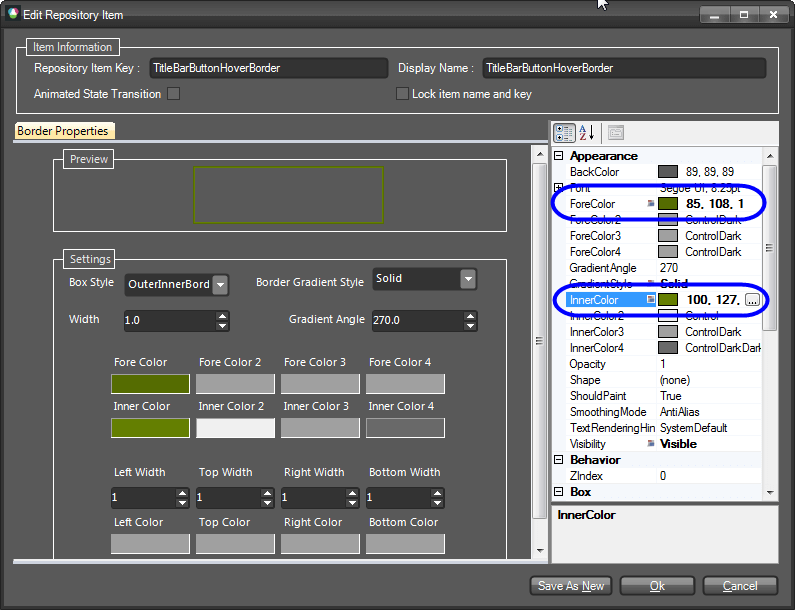 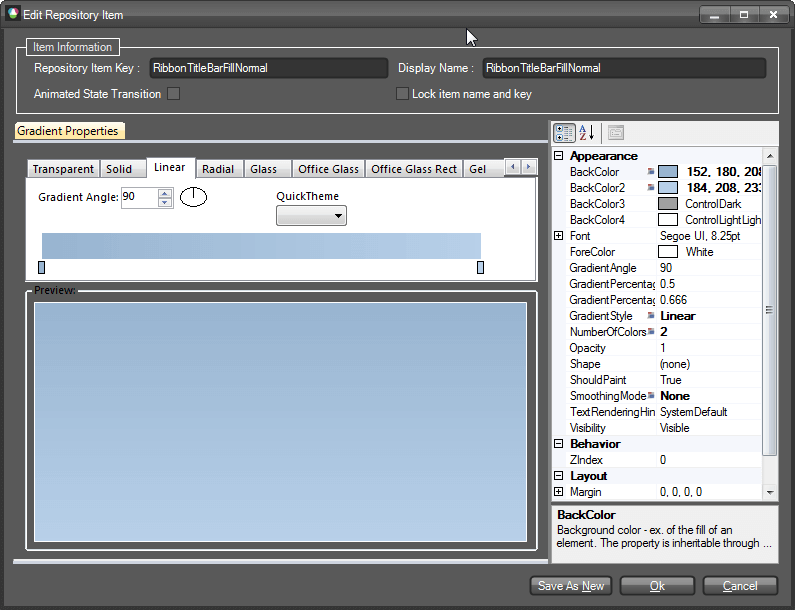 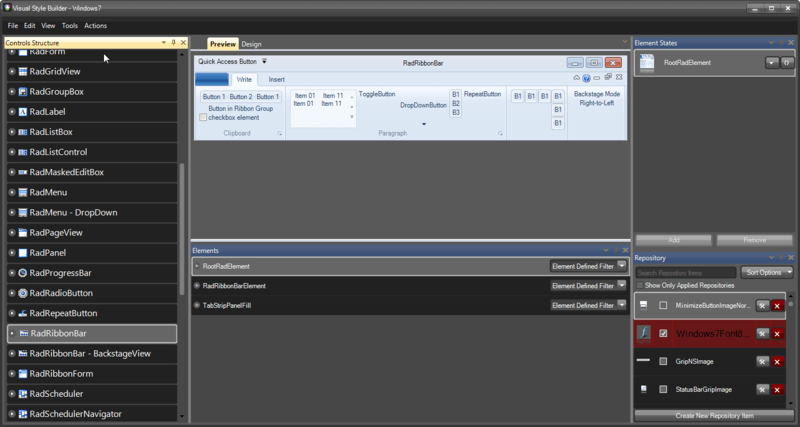 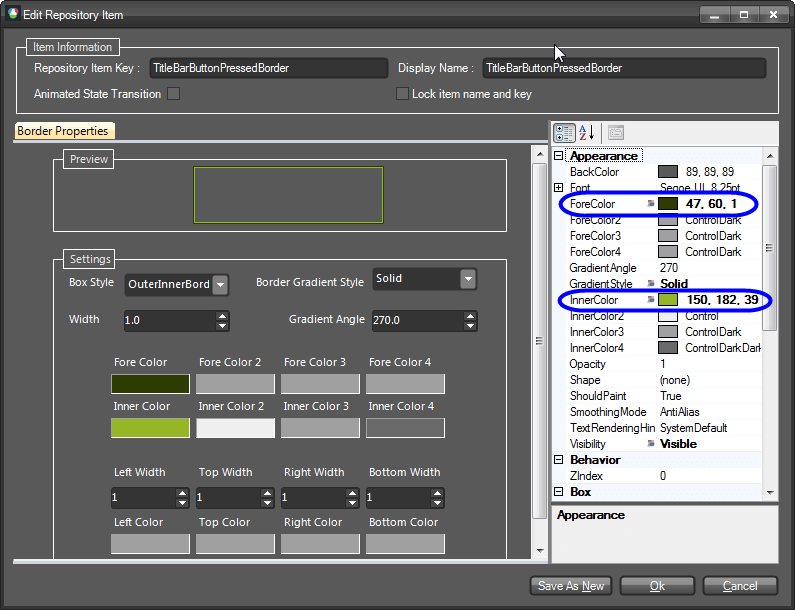 Finally, you will notice that the Ribbon’s Application Menu has to be styled as well. 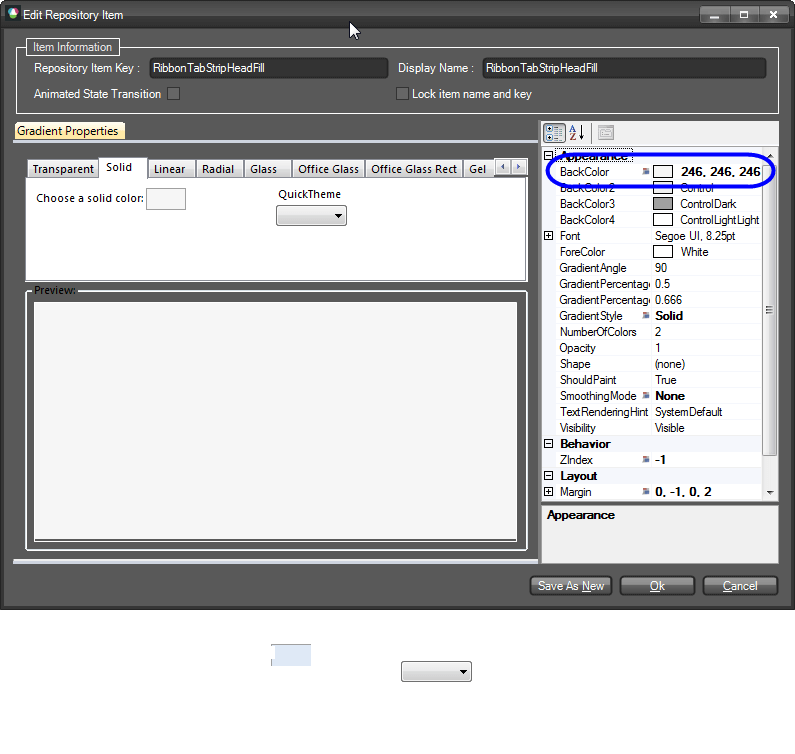 You can do this by selecting the RadApplicationMenu node from the tree-view in the VSB.